This is my second review as a member of Team Fox - a fantastic group of Teen Book Reviewers that Curious Fox has set up! I definitely had mixed feelings about this book - and it ended up being possibly my most posted-note filled book! In a post-apocalyptic world when no-one lives beyond their teenage years, the mysterious Roxanne arrives in Cyrus's village, fleeing the barbaric Zeds. She claims to be on a mission that can save them all, but can she be trusted? Cyrus joins her in her quest to search for the legendary Soterion - a place where books and knowledge are hidden away - but the Zeds are determined to get there first. This book had a rocky-beginning for me. I was thrown straight into a world I didn't feel was explained - which made it even harder to grasp as the novel continued. I was also under the impression I lot vocabulary was over-used but, I was pleasantly surprised when I began to enjoy book and the notes I made became more positive. It had intriguing characters, excitement and danger - as well as a lot of action thrown in. The pacing of this novel was really strong, never did I feel like my thoughts were drifting anywhere else and they were always focused on the novel. There was a small cast of main characters - some I felt I knew well but others I thought could welcome more of a back-story. When Roxanne arrives in Cyrus's village, running away from the Zeds, there's an instant added plotline of who to trust. What if you go along believing Roxy's lies? Or what is it's in fact all truth and no one believes her? Roxanne was: bewitching, interesting, sincere and intelligent. She was able to out-wit the people she was fighting against and be brave enough to carry on when anyone else would have given up. It's a great thing to be able to admire the characters you're reading about - even though I would have liked to see more of a development in Cyrus's and Roxy's relationship. She turned up - Cyrus fell in love because of her beauty. Cyrus proved to be a loyal protagonist, and a fighter. And Taja wanted nothing more than to be remember; not to died and be forgotten, which brought a relatable part of our lives into this book. This whole novel is set around the fact people only live until they are into their 19th year. This would mean by now, many of the people reading this novel would only have a few years left alive. This fact is really hard-hitting, knowing that if we were living in Stewart Ross' world our lives would really be over before they had begun. Women would be expected to be having children - when really we feel we're still children ourselves. The second half of this book I admit was much stronger than the first with an emotional ending where I had tears in my eyes. I think knowing the characters and their past more would have made me feel more connected to the story. 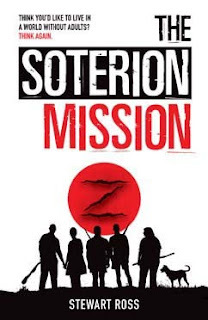 I felt ignoring the parts that I found frustrating really helped me immerse myself in the novel and I ended up being excited to go and pick it up to see what would happen and whether they would discover the Soterion. "They should meet either the river or Highway 24"
How do they know of the existence of Highway 24? There are no maps to point it out. 3 Stars - This book takes a while to immerse yourself in, and definitely has it's flaws yet, still enjoyable. Although, it has a few gory moments so, I suggest this for older Teenage readers. It sounds like it could have done with a little more editing to smooth out the flaws but I'm glad you still enjoyed it. I do love the premise, so I'd probably give it a go if had the chance. Thanks for the honest review! Definitely agree that it had flaws, but I was gripped throughout. 3 stars from me too, but that ending! Want too dramatic! WHY STWEART ROSS?! WHY?!?! I didn't love this but found the idea intriguing and I'm left wondering what will happen in the sequel after all the deaths at the end. Shame this left you undecided. I hate when there is lack of detail. But the idea of this sounds fascinating. Life at 19 would be so short! Great Review Sophie! I hate it when you have mixed feelings when reading a book and you can't decide whether you like it. Sounds like an interesting concept with obvious flaws though.